Located on a wild peninsula, Plougrescant offers landscapes of rocky outcrops often reproduced by painters and photographers. At the seaside you can find coves, sandy beaches and picturesque fishing ports. 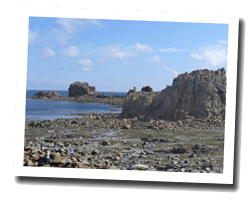 A coastal path allow you to admire the rugged coastline and islets scattered in the sea. 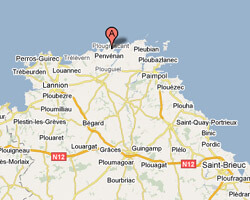 In Plougrescant enjoy a seaview holiday rental. Semi-detached 3 rooms house 50sq. m with beautiful View of sea. Garden 400sq. m with outdoor furniture and barbecue. 1 Bedroom(s), 1 double bed(s). Final cleaning : 20 €. House 7 rooms 180sq. m in a natural site. Bikes. Garden 1200sq. m with outdoor furniture, deck chairs and barbecue. 5 Bedroom(s), 0 double bed(s). short stays possibility. Final cleaning : 60 €. House 6 rooms 200m2. terrace. Swimming pool. House 5 rooms 80m2. Pets allowed. Villa 5 rooms 156m2. terrace, balcony with barbecue.